PA chairman curses Trump, vows to continue to pay terrorists under any circumstances. 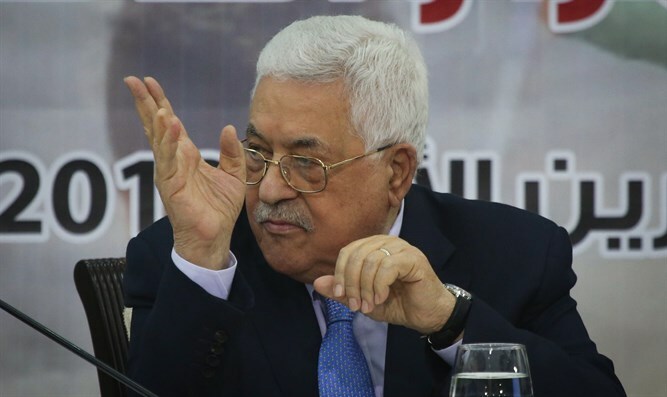 Palestinian Authority chairman Mahmoud Abbas called the PA's continued payments to terrorists a "red line" that would not be halted under any circumstances. "The salaries of the shaheeds (martyrs) are our red line. We absorb a lot of pressure, but we will not compromise or give up on this matter, the money will go to them - until the last expulsion," Abbas said during a speech at the Executive Committee of the PLO Sunday. Abbas used his speech to attack the Trump Administration and curse US President Donald Trump. "They are talking about the deal of the century.What remains to be done? The embassy was transferred to Jerusalem. UNRWA canceled the Americans and they claim there are only 40,000 refugees. "We will not give up East Jerusalem, which was conquered from us in 1967. We will not compromise on an inch of the Palestinian capital," Abbas said. "All of East Jerusalem is ours." He added that he would not be willing to try to bring about a separation between the Gaza Strip and the Palestinian Authority, despite the sanctions he has imposed on Gaza to weaken the Hamas government recently. At the end of his speech, the PA chairman declared that this was "the most dangerous stage for the Palestinian people," adding that "we must strengthen ourselves and stand up to the US and Israel."